For 30-years-old Ala Fathi Naim Atyani and her husband, Saturday the 11th of October was just another busy day at the start of the olive picking season. They drove in the car to their land on the outskirts of the West Bank village of Yasouf, where about 35 olive trees were ready for harvesting. Their trees were approximately 500 metres away form the boundary of the illegal Tapauch settlement, which was built on the usurped Yasouf land and about 200 metres away form a more recent outpost build by the illegal colonisers in an additional land grab. Around 10am Ala saw a group of seven settlers, wearing white head masks and waving metal bars, running downhill towards her and her husband and hurling large rocks at them. ‘The rocks were raining all around us’, said Ala. She cried out to her husband and they both started running towards their car, which was parked about 30 meters away. What happened than was a chilling sequence of events which Ala, still visibly shaken, recalled with clarity. As the settlers caught up with them, Ala desperately tried to open the passenger car door. When that failed, she run to the driver’s side and managed to get in partly, sitting on half of a driver’s seat next to her husband. The car door remained open with the left side of her body outside the car. Ala’s husband managed to start the car and drive down the hill surrounded by the settlers who continued to throw rocks, smashing the car windscreen and hitting the unprotected side of Ala’s body. 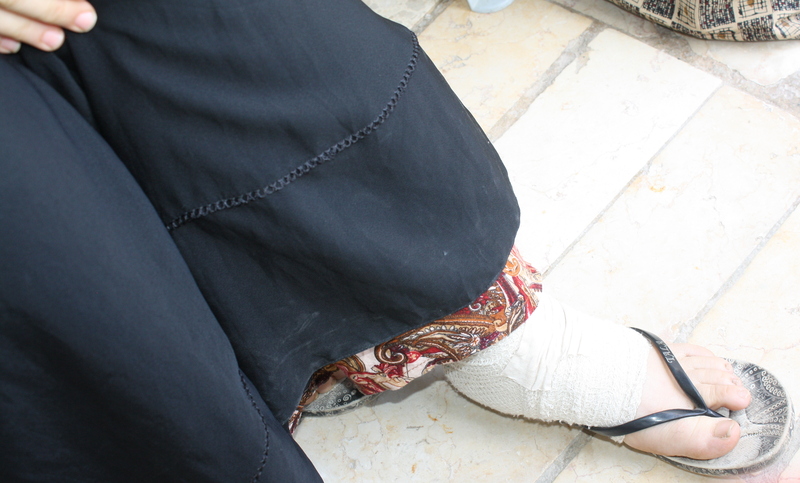 A settler wielding a metal bar hit Ala’s left leg injuring her ankle. The car gained some speed continuing down hill and that is when neighbors picking olives realised that Ala and her husband were in trouble and rushed to help. Masked settlers were undeterred by the villagers who confronted them wanting to stop their advance and they responded by firing from their weapons. ‘Tree shots were fired but I did not see if they fired at people or in the air’, said Ala who was at this time sitting on the ground with a painful leg injury. About 20 minutes after the attack started an army jeep came and four Israeli soldiers positioned themselves between the settlers and the villagers. Soon after that the Israeli police turned up with the District Ordination Officer (DCO), who took the account of what had happened. Ala was than taken by the Palestinian emergency services to the hospital in Salfit town, where she was examined and her leg was x-rayed. Fortunately the leg was not broken,but it was so badly bruised and swollen that Ala had difficulties moving around and looking after her three young daughters. ‘My whole body hurts, and my left arm and leg are very sore and red’, said Ala. I asked about her husband and Ala said: ‘He completely lost his voice, he can not speak and he has pains everywhere too’. How does she feel about continuing with the olive harvest? ‘ I just can not ever go to pick olives on the land where we were attacked, not without a protection against the settler attacks’, Ala said. Illegal Tapauch settlement seen at the top f the hill is a constant thereat to the Palestinians living in Yasouf village.